The absolute High-End radiator with excellent price-performance ratio! The new Phobya radiators offer top-of-the-line cooling performance combined with excellent appearance and high-grade build quality. The Phobya radiators of the new Xtreme series belong to the absolute High-end heat exchangers on the market. The copper fins are specially designed to work perfectly with Super-Silent fans (with low Airflow and noise level). The parallel cooling channels additionally ensure a low flow resistance. At the side of the radiator M3 threads are implemented to allow easy mounting e.g. on the case side. This radiator can also be operated passively, the performance is plenty even for larger systems. 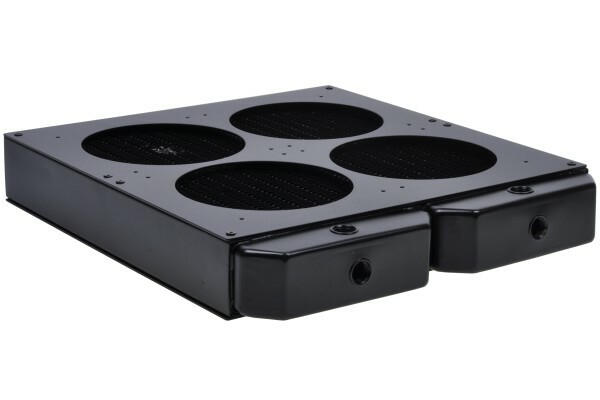 For this purpose the fan grill can be removed to allow contact of the whole surface with the surrounding air which greatly improves passive cooling performance. You can choose between two blinds are included. One blind is for 120mm fan and the other for 140mm fan. With demand also 8 fans (four 120mm and four 140mm fans) can be mounted. The radiator has 7 G1/4" connection threads for maximum fitting compatibility. -Over-tightening of the screws can damage the radiator. Please make sure that the screws so not damage the radiator's fins. Damages due to improper use are not covered by the warranty. Warranty: Warranty of seal and quality of manufacturing for 2 years. Passt der Radiator in den "Phobya Radiator Stand - black - Bench Edition: Quad 4x120mm" (38188) ?